Annika “Anni” Emmert arrived from California this week expecting to pick up her 3-D printed arm made by University of Central Florida students. She had no idea the students had engineered an extra-special delivery. The 10-year-old was born without her right hand and part of her arm. Anni thought she and her family were passing the time before coming to UCF for the pick-up with a day at the Clearwater Marine Aquarium home to Winter the dolphin and the inspiration for the Dolphin Tale movies. Anni sees a bit of herself in Winter, who her lost tail when she was 3 months old when it got tangled in a crab trap. A groundbreaking prosthetic tail was designed for her in order to save her life. 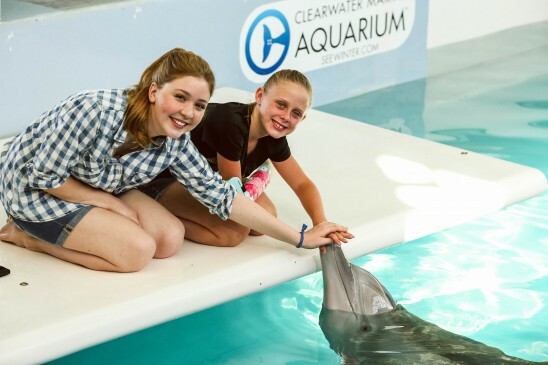 On Thursday, Anni’s trip to see Winter came with a surprise from Limbitless Solutions, the aquarium and actress Cozi Zuehlsdorff, the star of the movies. During a VIP poolside visit with Winter, Anni opened a cooler she thought was filled with fish for Winter and found her new robotic arm. “Oh my gosh, thank you,” she whispered to Limbitless Solutions leader Albert Manero while hugging him twice. Her mother, Karon Bryson-Emmert, looked on with tears of her own. Even Good Morning America played along, following Anni at the aquarium. Reporter Steve Osunsami told Anni they were getting some footage in anticipation of the delivery on Friday. GMA aired the surprise delivery Friday morning. Limbitless Solutions, based at UCF, creates custom 3-D printed arms for children in the students’ spare time. The UCF team began in July when Manero, an aerospace engineering graduate student and Fulbright Scholar, learned about a Central Florida family in need. He put together a group of friends and classmates who designed and delivered a functioning 3-D printed arm in eight weeks at a cost of $350. Then the team presented it to 6-year-old Alex Pring for free and uploaded the blueprints to the Internet for anyone to use at no cost. The team has since formed the nonprofit Limbitless Solutions; delivered four free arms (four more in production); and received kudos from Hollywood stars, including Robert Downey Jr. (a.k.a. Iron Man), and companies such as Microsoft and Blue Man Group. They give the families the arms for free. 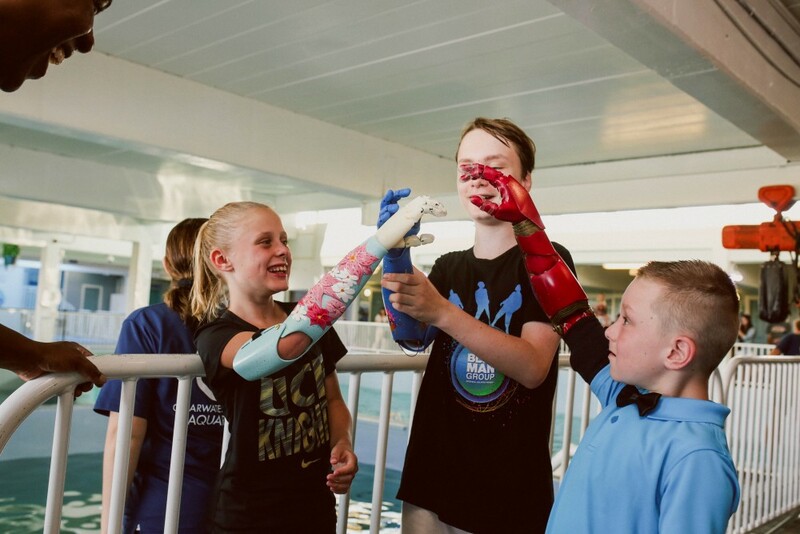 Pring, now 7, and Wyatt Falardeau, 10, who received a Blue Man Group-themed arm last month, joined the UCF students and aquarium staff in pulling off the big surprise. “Welcome to the club,” Wyatt said as he stretched out his bionic arm and then the three children high-fived each other. David Yates, CEO of the aquarium, said he was moved by the UCF students’ mission to help children around the world. Anni rides horses, plays soccer and loves to sing. But without a right arm she can’t play the guitar, swing on the monkey bars or ride a bicycle. That likely will change in months to come as she adjusts to her new arm. Manero and eight other team members attended the delivery and rejoiced as Anni and her family enjoyed the moment. The students have a GoFundeMe account and are eagerly looking for partners who can help them continue their work. UCF last month announced that it is developing a center to house the nonprofit student group and to create a hub for experts who will continue to research 3-D printing technology and its potential applications in the medical field. As a UCF student ( in the LIFE program), I am so proud of the accomplishments of these students! I will be glad to contribute to their worthwhile efforts! !